IBM InfoPrint 6500V15 printers (cabinet models) attach to a wide spectrum of IBM systems — from IBM mainframes, AS/400, RS6000 and parallel servers to PCs. Designed for high speed, tractor feed impact printing. Meet the demands for efficiency and manageability in high-volume environments. The IBM InfoPrint 6500V15 line printer with ribbon cartridge technology is built to adapt rapidly to changing business environments. The IBM InfoPrint 6500V15 line printers come with “ribbon minding” which tells you how much ribbon life is left. Also includes a state-of-the-art print engine and controller technology. You’re able to confidently meet the demands of back office, data processing and supply chain applications. Powerful remote management capabilities helps maximize printer up-time. Reliable used and refurbished IBM line printers are available. 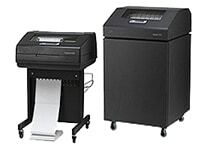 IBM line printers were manufactured by Printronix and we also offer used Printronix line printers. Call us at 1-866-430-6202. Looking for supplies or service? Call us at 1-866-430-6202 for details. High speed line printing for multi-part forms, bar codes, labels and large reports. Great for use with midrange servers like the AS/400 or IBM iSeries. Available with twinax connections.